OK so yesterday I kind of scribbled together my impressions of how Oil Kings camp has been playing out and made some final rosters suggestions. Well... ignore yesterday's piece. I was out at Day 1 of the tournament in St. Albert, got a chance to pick the brain of several NHL scouts, WHL brass, coaches and others in the kow and had several of my personal predictions blow all to hell. First and foremost, yesterday I said that Shayne Neigum wouldn't make my team. Well apparently that's why I'm not the GM as I've been assured (not by GM Bob Green mind you) that Neigum is a pretty important part of the line up. While I see him as a pretty one-dimensional player, fesity but lacking defensively and offensively, others hold him in higher regard than I do. I also predicted that 16-year-old Dylan Wruck was playing well enough to stick. He's been good but apparently the team is planning on sending him back to Beardy's with the hopes that he'll get a bit bigger beofre next year (he's listed at just 5'7 and 138 lbs). Definitely one to keep an eye on down the road, play-by-play voice A.J. Jacubec surprised me but wasn't joking when he said he could forsee Wruck as a 100-point man i the WHL one day. I'd take that seriously, A.J. knows his stuff. Cam Maclise was having an impressive camp but suffered whiplash during the Ft. Saskatchewan portion. He's sitting out still. I boldly said my two choices for breakout player of the year were Craig McCallum and Clay Cumiskey. McCallum should be a top 6 player but I've been told to expect Cumiskey to be a 3rd line guy so that might shoot down that theory too. Prior to tonight's game I was speaking with a bird-dog from NHL Central Scouting and an amateur scout for a NHL club, both of whom expressed concern about Edmonton's goaltending this year. I reassured them that camp had been a pleasant surprise in that department. 15-year-old Laurent Brossoit proceeded to play very well in his first half of the game against Swift Current. However, projected starter Dalyn Flette then entered the game and proceeded to stink the joint out. Shortly after Flette came into the game a NHL scout tapped me on the shoulder and suggested "Swifty has to be feeling pretty good right about now, they know they can win this one if they just shoot at the net!" The punchline here is that they were down by a goal at the time and sure enough, they went on to win the game. I get the sense that 19-year-old Harrison May has done his job; he was asked to come to camp in order to make sure that competition for the backup goalie spot (behind Flette) kept everyone focused. It's my impression though that it's a 2-horse race between Cam Lanigan and Patrick Terris. Wade Epp, the big 6'5 defenceman that Edmotnon had in camp earlier? Well he didn't get cut, he left on his own volition because he apparently wants to keep his NCAA options open. Those I spoke with had no idea what NCAA school he was talking too but at least one person told me that Epp is "getting some bad advice". He wasn't having a great camp but the size and the potential was there and I think the Oil Kings were willing to let him find his way this year and live with some growing pains. Tomas Vincour (on the right in the picture) will arrive back in Edmonton on Sunday but isn't expected to play in the tournament. That's not by choice though, P.R. man Jordi Wiedman tells me that if it were up to Vincour the winger would go right from the airport to the rink and maybe even suit up in the car on the way. Talk about eager... this should be a great year for him. 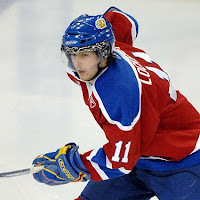 One NHL scout told me tonight that he expects Vincour to be a "very high draft pick". One thing I did get right yesterday is that the guy who has really made a name for himself this fall is defenceman Jesse Pearson. 3 fights in camp and got into another one tonight against 20-year-old Dale Weise, a draft pick of the New York Rangers. Weise is listed at 6'3 and 210 lbs... Pearson is 6' and 162 lbs. Needless to say he took a few but believe me, Pearson did more than alright and got in a few of his own. He's quickly becoming a favorite of the staff and the rest of the team. guys like Stephenson, Foster, Burns, Proulx and Balness in the mix to round things out. You'll notice the vets I have not included here are Braeden Adamyk and Brent Henke. On the backend I think it starts our fairly easy. Van de Mosselaer, Pysyk, Lockerby, Nichol, Pearson, Hlookof and Tervonen are in but Laroque and Friesen are challenging too. I still personally think Cepek is only around until the team finds a trading partner. In net, as I said, it's Flette plus one of Lanigan or Terris and while I've seen Lanigan play lights out at camp, I haven't seen all his games and I'm told he wasn't always excellent. I'll still guess that it'll be him. 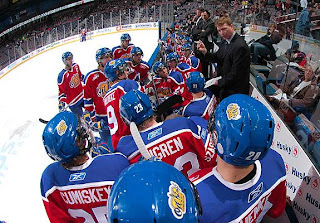 The 2nd year for the Edmonton Oil Kings is rapidly approaching and as rookie camp and main camp gives way to the annual mini-tournament, the WHL franchise has hacked the number of players left in camp. 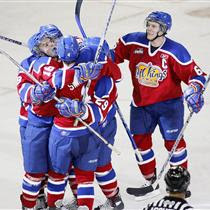 36 players remain on the active roster for the Oil Kings as they prepare to take on the Swift Current Broncos, Medicine Hat Tigers and Regina Pats this weekend in St. Albert. Amongst that group are 15-year-olds Michael St. Croix, Travis Ewanyk and Laurent Brossoit. The taste of WHL game action will be a treat for them but all 3 will return to their club teams next week. Dalyn Flette - The incumbant netminder who Bob Green recently described on The Pipeline Show as a guy who will be the starter coming out of camp. Cam Lanigan - Only 16-years-old but from my limited viewings of rookie and main camp, the best goalie performances so far have come from this Calgarian. Patrick Terris - 17-years-old and has had a very impressive camp thus far, a realistic option for the team. Harrison May - He's 19-years-old and was brought in to ensure that competition in camp was, well, competitive. He's been solid as expected and will keep the pressure on. 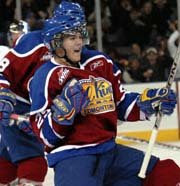 The Oil Kings website lists Devin Balness as a defender but I believe he's a forward. Perhaps he's that versatile, I don't know but Balness has looked good and could be one of the 16-year-olds with a realistic shot. Kurtis Decker, Kieran Friesen and Braeden Laroque have been good enough to get this far but I'm not sure that any of them will make the final roster. The tournament should decide that. Jesse Pearson has definitely gained my attention having 3 fights with 3 different Oil Kings vets already, and he's done well. He's physical, has thrown the biggest hits of camp thus far and provides that element that the team lacked until aquiring Brennan Sonne last year. The fact that he's still here and 6'5 Wade Epp is not... tells me a lot. Adrian Van de Mosselaer will be back, he looks bigger and stronger than last year and should be a lock. Brandon Lockerby (pictured) was a valuable chunk on the PP last year before he went down to injury but in the search for offence from the blueline, he should be in. Mark Pysyk is definitely on the club this season and will be the focal point of the team for the next few years. Tyler Hlookoff, Cameron Cepek and Drew Nichol are all returning veterans but strong performances from newcomers could make any of them expendable, I don't think any of the three can afford to have a disappointing tournament. Interesting to note that 20-year-old J.P. Saszkiewisz has left the team and joined the University of Alberta Golden Bears. Chances of him being one of the 3 overagers on the team were looking less and less each day as Dowd and Lee were clearly better up front. The other 20-year-old I expect to be kept is Brandon Lockerby as Cepek really does nothing very well. He's a big body but doesn't use it unless going up against really small guys and even then he's often losing battles. If Pearson can replace the fighting and the defensive play, Cepek is expendable. It might be a bit early to start predicting a breakout player for the season but I posed the question to GM Bob Green last week and he offered up Brent Raedeke's name. He'll be leaving Edmonton to attend the camp of the Detroit Red Wings including the Traverse City tournament. I offered up two names: Clay Cumiskey (pictured) and newly married Craig McCallum. There definitely will be some tough decision to make out of camp and that's a good problem to have if you're the brain trust of the Oil Kings. It's been 9 months since he last played a meaningful game, but Oiler prospect Tyler Spurgeon is about to show people that he's back and ready to play. 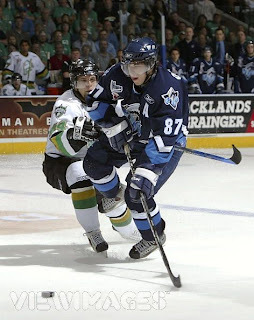 It was in a game against the Providence Bruins way back on November 18th, 2007 when Spurgeon went down to injury. In an exclusive interview I had with him recently, the Edmonton product described what happened that night. "There was a puck rimmed up the boards and their defenceman kind of counter-pinched me," he described, "I fell down to my knees but the puck was still within our zone so I chipped it out from on my knees and then a player finished me from behind and I was on my knees against the wall so..."
Spurgeon suffered a serious concussion which knocked him out of action for the rest of the 2007-08 season. Recovery was a painfully slow process for the 22-year-old who says that it wasn't the severity of the actual concussion that kept him sidelined but rather the post concussion effects. 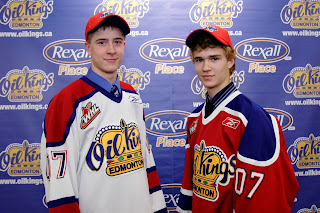 In late January during the Top Prospects event I ran into him in the bowels of Rexall Place where he was working out. At the time he said the headaches were subsiding but he was still experiencing optical problems especially blurry peripheral vision. I recently asked him if at some point last year he grew concerned that the injury might be career threatening. "That's the thing, it gets to be pretty frustrating so you talk to a lot of people who have been in the same situation as you, I talked with Jarret [Stoll], Dwayne Roloson hooked me up with [Nelson] Emerson who is now the assistant coach with the L.A. Kings because he had to quit because of concussion," Spurgeon said, "You talk to them and they tell you that it's going to get better but when you're not feeling good or it's kind of up and down, it gets frustrating not knowing what's going to happen." We always hear athletes talk about the dizziness or the headaches that plague them when training or riding the stationary bike but Spurgeon says the lingering effects of the concussion infiltrated his daily routine too. "There was a lot of stuff, I remember with text messages I'd open them up, read them and then go to reply and I couldn't remember the details of the message or maybe who it was from," he said, "Fatigue is a major factor. Waking up every morning and having that headache, it just wears on you and you get tired. Some nights you sleep well and others you don't so it can get really frustrating." Eventually though Spurgeon did start feeling better and says that around April he started getting hopeful that he could finish the year in Springfield. However, he increased his skating practice to simulate games but the motion and circling drills still bothered him. That led him to take an extended break from activity which in the end may have proved to be the best decision. "It probably wasn't until the end of May and after I'd taken basically more than a month off that I started to feel a lot better," Spurgeon said, "I think in a lot of ways during the season you see that next game or that next week coming up and you think 'hey if I start skating here maybe I can play here' and so i was pushing and you miss it so much that maybe you drive yourself a little harder than you should. Instead I just got away from it all." During the month off he was able to attend the Memorial Cup in Kitchener where he saw his little brother and the Spokane Chiefs capture the CHL title. Brother Jared Spurgeon (left) was drafted by the New York Islanders. "It was incredible, I was so happy for him." said Spurgeon proudly, "To have that breakout season and to do as well as the team did it was huge for him." With constant help from Oilers head medical trainer Ken Lowe and Dr. Dhiren Naidu (a team physician), Spurgeon found the proper balance between rehab, training and rest. As a member of the Kelowna Rockets Spurgeon also had a concussion but says the two experiences were very different. "With the one in Kelowna it was one big bang where I couldn't do anything and then all of a sudden I was good where as this was more of a slow progress, " he described, "I'd start feeling better then take some steps back and that was one of the toughest things to deal with." A couple weeks ago I wrote my top 20 list of Oiler prospects ofr Hockey's Future and as part of my prep work for it I contacted the Oilers for an update on both J.F. Jacques and Spurgeon. What I was told was "Not Spurgeon but getting close". As a result I did not include Spurgeon on my top 20 list; as a player who missed almost an entire season with a concussion and was not yet recovered, I think that was justified. On Friday night at Oil Kings camp I ran into Pete Semonick, Spurgeon's agent, who mentioned he'd noticed the top 20 didn't include his client. He'd also heard me say on the air in the last couple of weeks exactly what I was told by Edmonton, that Spurgeon wasn't ready to go. "He's actually been 100% healthy and skating hard for about 7 or 8 weeks now," Semonick informed me. Shortly after my chance meeting with Semonick I called Spurgeon to get the low down. "It's been a fair while now, I can't even remember when I took the concussion test last but I passed that," he said, "Before I was checking in with Kenny [Lowe] and Dr. Naidu every couple of weeks but I haven't had to do that at all in the last two months." "I've been working out with Fernando [Pisani] and [Kyle] Brodziak in St. Albert and I've been doing the same stuff as them; skating, shooting and weights since June." Now symptom free the next goal is obviously to prove to the organization that he shouldn't be written off and that he can pick up where he left off as a player on the rise. To do that though he's got to play the same feisty, 2-way role that got him drafted and that will mean contact and getting dirty in the corners but Spurgeon says he's not about to change. "Hockey is a game where you're going to get hit and you're going to be giving hits and I can't worry about it with the style I play." he said. In a normal off-season Spurgeon's training would begin at the end of May which is pretty much the same as this summer so the player should be coming to camp as though it were any other year. Last fall he arrived at training camp 3-weeks removed from rehab from abdominal surgery but this time around Spurgeon says he's 100%. "This year I've got a full summer of training in, my shoulders are good and my head is good so it's actually a really exciting time for myself," he said, "I think the last time I played a healthy season was when I was 18 in Kelowna and things went pretty well for myself and the team there." That said, there are those who are going to want to lable Spurgeon as injury prone. Just don't say it to his face. "That's the worst thing that anybody can say to me," he laughed, "I hate hearing that I'm injury prone because I think a lot of it was just bad luck from playing in some rough situations and getting stuck in some bad spots. I definitely want to clear my name of that." His goal is to make the Oilers but brealistically he knows Springfield is likely where he'll end up. Playing for former Kelowna head coach Jeff Truitt (right) should make for a nice transition back. "He's knows what I'm all about and I know him as well and it's a great relationship," said the 2004 8th round pick, "He holds me accountable and I know that he's a guy that I can go and talk to about my game and if he's hard on me it's not for personal reasons but it's because he wants me to get better." If you're looking for a potential candidate for the captaincy in Springfield you could do a lot worse than by pinning a 'C' on Spurgeon's chest. There are other worthy choices as well (Tim Sestito comes to mind) but no other Falcon knows the coach as well as Spurgeon who wore the letter as the leader of the Rockets. For now though, Tyler Spurgeon is just looking forward to getting to camp and showing everyone that he's back and ready to play some hockey. "I've been looking forward to this for a long time now, it's too much time away from hockey for this guy!" The Edmonton Oilers open rookie camp on Friday September 12th and have their first on ice sessions on the 13th at the Edgeworth Centre in Camrose. The mini-tournament rosters will consist of players with less than 100 pro games to their credit... through a combination of appearances with Springfield, Wilkes-Barre and Stockton, Spurgeon has played 85 total. Oh and about that Top 20 list... I can't update it anymore but suffice to say that if I'd have known he was healthy, Spurgeon would have been on the tail end. Consider him now ranked at 20.5 (although he would have been slightly higher than that). I've gotten a few emails and comments suggesting that the series of articles here at Coming Down The Pipe! this month won't be complete unless I offer up some sort of prediction or conclusion. I didn't really plan on doing that, I wasn't trying to make an argument for or against any of the 5 players I profiled, I was simply trying to point out the pros and cons each guy brings to the Oiler table. So I'm going to offer a summary of a sort. A head-to-head comparison ranking which will hopefully satisfy you readers. I'm going to rank the players in 8 categories that I'll briefly describe, the player I feel best fills the category will be ranked highest. Simple enough? 5) Schremp - long been the biggest knock against him. OFFENSIVE UPSIDE - A combination of best playmaker, top sniper, etc... simply, who could be expected to put up the most points this year. 1. Schremp - most might come on the PP but they don't ask when, just how many. 2. Potulny - had 2 fewer AHL goals than Schremp in 20 fewer games. 4. Jacques - sooner or later something will go in off his back... right?? SIZE & PHYSICAL PLAY - Again, pretty self explanatory. Looking at throwing the body, dropping the gloves and generally playing an in-your-face style of game. DEFENSIVELY SOUND - Who can the coach put on the ice and feel confident that the opposition isn't going to treat like Team Pygmy in basketball? EXPERIENCE - At the NHL level or as a pro, who's got more playing time under his belt? 2. Potulny - 44 NHL games and almost 100 more on the farm. PRESSBOX IMUNITY - By this I mean who is going to be least affected by long stays in the pressbox as a healthy scratch? CONTRACT POLITICS - Who's contract situation is most likely to help his cause of staying in or making the NHL? 2. the rest of them are waiver exempt and can be reassigned freely... although Brule is just 14 NHL games away from crossing that line. My conclusion to this experiment is that trying to predict the future like this is dumb. Too many variables are not accounted for; will Jacques be 100% healthy? Will Schremp's intense summer training and preperation be enough or not? Can Brule accept being a 13th forward? Can Potulny adjust to new teammates, coaches and system quickly enough? Will there be injuries to any of these 5 or to the rest of the NHL roster that frees up more spots? Are there trades still to come? There are so many questions that won't be answered until training camp begins that trying to determine end results a month ahead of time is borderline pointless. I started this series with the intent of showing why several players were in the mix and I think I've done that. 2) They will successfully push Mathieu Roy through waivers leaving 7 defencemen and only 1 vacancy up front as the 13th forward. 3) Ryan O'Marra will last longer than last year but eventually be given a top-6 role in Springfield and play on the Falcons PK this year. 4) J.F. Jacques will be one of the last players cut from camp and sent to Springfield "for conditioning after not being able to train to a full extent over the summer". 5) Edmonton will take advantage of the small window of opportunity remaining and send Gilbert Brule to the farm where he will play on the top line and rediscover his scoring ability. 6) Rob Schremp will impress but be the last player cut. He'll have the inside track on being recalled first should a forward spot open up due to injury or when one of the 3 goalies is moved. Leaving the defensively reliable, pressbox imune, waiver eligible, positionally versatile, utility man Ryan Potulny as the 13th forward to start the year. Now... can camp start already? It's rare that someone pretty well off the radar will come to camp and make the team but it has happened and as recently as 2 years ago with a player very few people had even heard of. In my training camp preview for HF back in the fall of 2006 (see here) I called the player "a dark horse" and suggested he was someone "that could surprise". Although I said the guy might impress and turn some heads I didn't go so far as to predict he would actually make the team. Let's face it, only a complete moron would predict a 5'10 forward from a non-hockey nation would crack a NHL roster right? Well Patrick Thoresen proved that no matter how predicatable training camps usually are, the possibility of someone coming out of nowhere does exist. I've been asked on the air by Bob Stauffer and Corey Graham to offer up my darkhorse player, the guy I think could surprise. Up to now I've said Ryan Potulny and although I think he ultimately has a better shot at the roster this year, you know he's not the underdog in this blog series because he was detailed earlier (see here). With that said... it's time for me to look at who I think is a legit longshot. Not that I expect him to make the team, but he's at least got a Norwegian midget's chance at it. To be my darkhorse pick you have to be able to fill the job description of a NHL 4th-liner which is to say: someone who brings energy, grit, speed, physicality and is not a defensive liability. I've profiled 4 Oiler prospects in this series and most of them fulfill those requirements, some more than others. Ryan O'Marra could be the perfect fit for Edmonton's 4th line. Those 5 must-have traits I bolded above? There are check marks next to all of them on O'Marra's score card. At Team Canada's training camp head coach Brent Sutter had narrowed down his last roster spot to two players; O'Marra and Calgary Flames 1st round pick Kris Chukco. Sutter told us (March 2007) that O'Marra was at his best when he was playing physical and that in fact, for him to make the national team his job was to make sure he hit someone every shift. His 4-year OHL career was spent mostly with the Erie Otters where he was always a key player but never the team's leading scorer. In his fourth season the Otters sent him to Saginaw, a team that could contend for the league title. He missed much of that campaign with ailments including a season ending knee injury that hampered his summer training before he made his Edmonton camp debut. He was originally drafted by the New York Islanders, 15th overall in 2005. Reportedly he made a very positive impression on the Islanders at training camp and enjoyed AHL success at the end of the 2005-06 schedule where he had 5 points n 8 games including 4 goals. 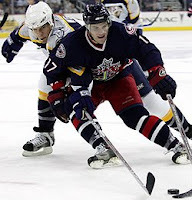 Some NHL people have told me that O'Marra nearly cracked the Islanders' roster in the fall of 2006 but a camp injury precluded his chances and he was returned to Erie. At the 2007 trade deadline the Oilers shipped off franchise player Ryan Smyth to Long Island. With their Kyle Okposo request denied by the Isles, Lowe and the Edmonton brain trust instead came away with Robert Nilsson, O'Marra and a 1st round pick (Alex Plante). Knowing that reaction to dealing Smyth was bound to upset a large percentage of their fanbase, the Oilers arguably went too far in pumping up the value of the return package. In O'Marra's case, Edmonton trumpeted his 2 gold medals from the World Junior Championships, his strong performance in the AHL as an 18-year-old and the fact that he was predicted to be a top 10 pick in his draft year. That praise, coupled with the fact that a player of Smyth's magnitude was involved in the trade, reportedly went to O'Marra's head. The Tokyo-born forward joined us in studio with Theo Peckham during prospect camp in June of 2007 (listen here) and came off as mature, well-spoken and confident. 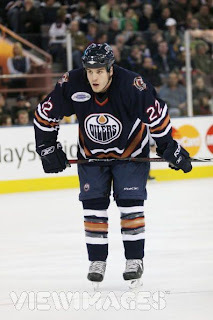 When he came to camp in 2007, O'Marra was coming off the knee injury and, although he insisted he was 100%, did not perform up to expectations - which were arguably too high based upon all the hype that the Oilers themselves partialy generated after the Smyth trade. Suffice to say that when he was a fairly early cut in camp it didn't go unnoticed. Some blamed the injury, others said O'Marra came in expecting a spot to be handed to him because he was told by the Islanders that he nearly made the NHL the year before. Whatever the case, it was off to Springfield. Temporarily. O'Marra lasted 3 games in the AHL before he was demoted to Stockton of the ECHL, almost unheard of for a 1st round pick in his rookie pro year (aside from goalie Devan Dubnyk the year before because Edmonton lacked an AHL affiliate of their own). Remembering the hype and praise the Oilers bestowed on O'Marra after the trade it was puzzling to see that 6 months later they'd stuck such a promising prospect in "The Jules Vern League"... 20,000 Leagues Under the NHL. 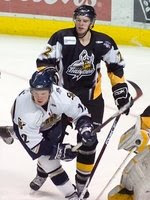 To make a long and unpleasant story shorter, O'Marra and the organization had their differences in 2007-08 but eventually the player earned an ECHL All-Star nomination, worked his way back to the AHL, had a hot streak, missed time due to injury then played well in Stockton's playoff series against Las Vegas to close out the year. Why O'Marra will make the team: If motivation was money, Ryan O'Marra could buy the Oilers from Daryl Katz and make himself the captain. After last year, I can't think of a player with more to prove than O'Marra. That he didn't belong in the ECHL, that he should have played more for Springfield down the stretch, that he has the work ethic and character to compete at training camp as expected now that he's healthy and that he's still deserving of that aura that clings to 1st round picks. I've spoken with O'Marra several times over the current off-season including on the air (listen here) and when I do I hear a different person than I did a year ago. More mature, no longer disgruntled or feeling bitter, O'Marra is now just focused on what he needs to do to be successful. At close to 6'3 and 220 lbs, O'Marra is only slightly smaller than J.F. Jacques who is routinely regarded as a beast of a young man. Like Jacques, O'Marra can be extremely effective on the forecheck by playing the body. He did it for Brent Sutter, he did it in Stockton and he knows that's what he needs to do for the Oilers too. O'Marra can play on the wing or at center but is one of the best faceoff men in the organization, including the NHL roster where Marty Reasoner and Jarret Stoll are no longer to be found. A rookie needs to carve out a niche for himself to stick and being a guy that can take key draws has always been a strong point for O'Marra. Why O'Marra will not make the team: Simply put, for O'Marra to grab a NHL job would take a combination of an outstanding, lights out camp performance from him coupled with disastrous efforts from the 4 players profiled already in this series. When was the last time a player went from the ECHL to playing in the NHL? OK, Liam Reddox's 1-game appearance last year doesn't count. Seriously, it's unrealistic to expect that a player can make that big of a jump so quickly unless you subscribe to the theory that Edmonton was sending him a message and that he actually was deserving to stay in the AHL all year. That said if it's Edmonton's objective to tear him down and build him back up, (some would suggest they've done that with Rob Schremp), wouldn't that process require a second year - the rebuild year? The one where O'Marra is given top-6 forward minutes in Springfield so that his real shot comes in 2009-10? It may be a conspiracy theory or just the time needed for player development but the sense I'm getting is that this year O'Marra is indeed expected to be an important figure on a much improved Falcons line up. Although he's not projected to be a scorer in the NHL, it is reasonable for the Oilers to expect more offensive production from O'Marra than he provided last season. It's true that during most games he played he was used sparingly but 2 goals and 9 points in 31 AHL games isn't enough. The last reason is one that is shared by most of the 'bubble boys' and that's the fact that Edmonton can reassign him without having to worry about waivers. O'Marra is only 21-years-old, there is no need to rush him before he has proven that the AHL is no longer beneficial and at this point, no one can say that. In the end Edmonton will do what is best for the team and if a Norwegian can come out of nowhere to steal a job away from Marc Pouliot 2 years ago then why can't an upstart from Japan do it again in 2008? It isn't a stretch to say that the ideal player Edmonton has in mind for their fourth line is right under their nose yet most Oiler fans have a hard time believing that J.F. Jacques is the right guy. Once known as The Crazy Train during his days in the QMJHL with the Drakkar of Baie-Comeau, Jacques' success at the pro level has been completely on the farm. With 53 NHL games under his belt the personable Jacques is still without a point and that leads many fans to write him off as a bust or a prospect. Edmonton selected Jacques in the 2nd round back in 2003 using the second pick they acquired from New Jersey when they swapped first rounders. (You know, the little known Parise/Pouliot deal). His junior career with Baie-Comeau was largely under appreciated because the Drakkar were a below average team for most of his tenure. He was teammates with Patrick Thoresen for one season, finished off as team captain and led the squad in scoring during the 2004-05 campaign with a mere 78 points. 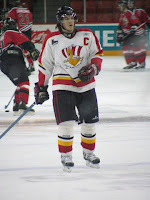 Throughout his QMJHL days he gained the reputation as one of the toughest and most feared players in the league. His penalty minutes dropped significantly after he was drafted simply because he didn't have a lot of challenegers. In his last season with the Drakkar the Oilers claimed that Jacques could pretty much do whatever he wanted to do on the ice because no one was willing to try and prevent him. It's why his point totals nearly doubled from year 3 to year 4. 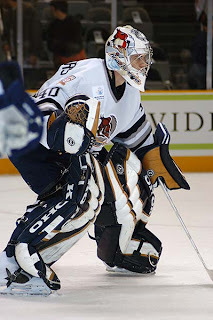 He ended the 2004-05 season with a brief 6-game stint in the AHL with the Edmonton Road Runners. This was my first opportunity to see the man-child play in person and to this date I still insist that his first shift with the Road Runners was the best I've seen of him as a pro. Now Jacques is not a natural goon; he's a big strong tough player who can play that role but he has more to offer. The problem thus far has been that he's been trying to do too much at the NHL level rather than simply playing the role Edmonton wants him to perfect before expanding his game. Edmonton wants a running mate for Zack Stortini, another player who will throw the body around, antagonize the opposition and when the situation arises take care of business just like he did in the clip against Columbus. Up to now, that's been challenging for Jacques to accept. At every other level including the AHL, he's been able to do all things including score so making the mental adjustment to accept his role has taken time. However, I'm told he's now flicked that switch. Why Jacques will make the team: Of all the 'bubble boys', those players with realistic chances of making the team out of camp, Jacques is the biggest and strongest. When you picture the stereotypical fourth line player, the energy line player, Jacques best fits the job description. Especially when picturing a replacement for Curtis Glencross... who in the Oiler system most resembles his style of play if not Jacques? Jacques comes cheap. His newly signed 2-year deal will only cost Edmonton around $700K so he's a cap friendly option. He's been in the system for a while now, has made spot NHL appearances in each of the last three seasons so you could say that he's paid his minor league dues and is in line for a full promotion. Why Jacques will not make the team: Injuries. Over his career Jacques has been hurt several times to various degrees. A hyper-extended elbow with the Springfield Falcons, shoulder troubles in junior but most importantly a season ending back injury last year. Jacques was limited to only 38 minor league games in 2007-08 before running into the back problem that he has described as a herniated disc. Surgery was considered this off season but delayed when rest and rehab seemed to be doing the trick. However, just because Jacques says he's fit and ready to go for camp, that doesn't mean it's not just lip service; why would he say otherwise? He's not going to plant the seed of doubt in the collective mind of the organization as to his health. However, if he's not 100%, he's not going to make the team and camp will reveal that one way or another. Although drafted the same year as Marc Pouliot, Jacques has not played enough NHL games where he would have to clear waivers to be sent to the AHL (According to Assistant GM Rick Olczyk). Being waiver exempt gives the Oilers an out to settle any close roster battle and they can use the excuse of wanting to give Jacques playing time to regain his form after the injuries. The lack of hard physical training may have set Jacques back from a conditioning persepctive. That's just specualtion on my part but it's reasonable to expect that with the injuries that he hasn't been over-exerting himself while training. If that's the case, it's probably unfair to expect that he'd come to camp and win a spot that's hotly under contention. Whether or not he's the leading candidate, J.F. Jacques should not be The Forgotten Man when camp opens because he's got every right to consider his chances as realistic. Oiler fans may have begun to write him off but the organization certainly has not and their faith my prove justified sooner rather than later. The Edmonton Oilers announced this morning that they would be hosting a 3-team rookie tournament in conjunction with the Calgary Flames and Vancouver Canucks to be played in Camrose Alberta. 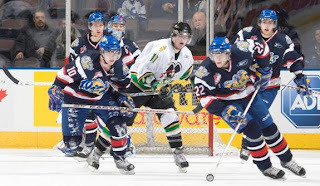 As first reported by The Pipeline Show way back on June 13th and then discussed more with Kevin Prendergast on the air on June 17th, the 3 Western NHL teams will showcase their top prospects in a round robin style exhibition. It was originally planned as a 4-team tournament that would have included the University of Alberta but instead the annual Bears/Oilers game will be played at Clare Drake (as always) on the same night that Calgary and Vancouver square off in Camrose. Details including dates and times can be found on the Oilers official site (see here) and you can hear both Patrick LaForge and Kevin Prendergast talking about the genesis of the tournament, who will play and more tonight on The Pipeline Show. There are two players on my list who I could have described as The Wild Card but because this guy is coming to his first Edmonton Oiler camp this fall, and few really know what to expect to see from him when he gets here, I'm going with Ryan Potulny. We had Potulny on the show in July (listen here) and asked him a variety of questions ranging from his college days spent at the University of Minnesota, his time with the Philadelphia Flyers organization and of course the recent trade. First a little background on the player that not many Oiler fans know much about yet. 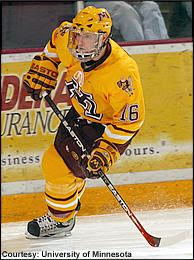 As a member of the Golden Gophers Potulny racked up a total of 118 points in 99 career NCAA games played over 3 seasons. His freshman campaign was limited to only 15 games thanks to a serious knee injury. Still, in that shortened season the North Dakota native made an impact potting 14 points. His sophomore year proved that his rookie production was no fluke and he went on to score 24 goals and 41 points in 44 games. 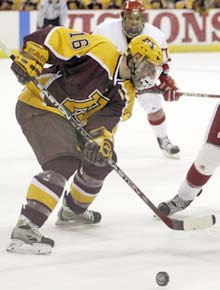 The Flyers reportedly enquired about his interest in turning pro after that year but Potulny chose to return for a final season with the Gophers. And what a year it was. He'd been pretty much a point per game player during his first two seasons at Minnesota but as a junior he surpassed both of those two previous years combined. In 41 games Potulny scored 38 goals and recorded 63 points. He was 20 years old at the time and had clearly reached a point in his development where he was ready for the next step and so at the end of the college year he turned pro with Philly. He played in a pair of NHL games and hit the scoresheet with an assist in one of them. 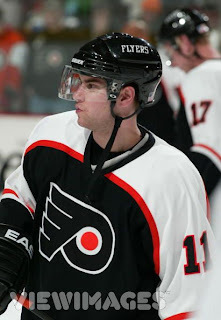 In 2006-07 Potulny was shared by the Flyers and their AHL affiliate across the street, the Philadelphia Phantoms. The Flyers were horrible that season and finished dead last in the NHL. Potulny appeared in 35 games with the big club that year and earned 12 points in cluding 7 goals. Having never met or seen Potulny play in person I've done a bunch of asking around to try and get a sense of the kind of player he was in college and now as a pro. One former player who squared off against Potulny and the Gophers on a regular basis told me that "He's a really good player, a big time scorer. We played them a lot and he was by far their best player." 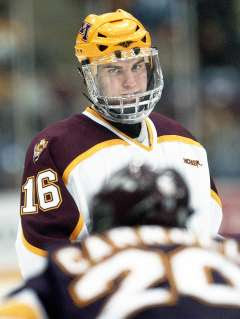 That was in Potulny's 3rd and final year at Minnesota when he led the Gophers in scoring by 12 points over a freshman Phil Kessel and had a whopping 40 more points that 5th overall NHL draftee Blake Wheeler who was in his sophomore year. In college Potulny was a scorer. As a pro he's had to alter his game a bit in order to thrive but he's evidently done that scoring 47 points in 58 games last year with the Phantoms. Having purchased a bunch of free agent forwards last year and discovering a desperate shortage of offensive minded blueliners, the Flyers and the Oilers hooked up for a fairly obvious swap of asets that both teams had excess of. Edmonton gave up Danny Syvret who never seemed to get on track as a pro after being drafted 81st overall (3rd round) by Edmonton in 2005. Syvret fills a big hole in Philly, at least at the minor league level, and Potulny is coming to Edmonton much like Gilbert Brule, hoping the change in scenery leads to a bigger opportunity. "It's kind of a new chance for me to start over and hopefully I'll get a better chance there," Potulny said on the show, "When I was in Philly and up with the Flyers I was put on the 4th line role, which is fine with me, but when you're put on that line you change your [style of play] a bit." And by that he means, concentrate more on being defensively responsible, less on scoring which is what he's always been counted on to do. "You kind of adapt to what line you're on and what the team needs from you," he said, "I think what I'm trying to do now is be a good 2-way player that can play well in the defensive zone but chip in offensively." In his total of 44 NHL games Potulny has 14 points, an even split between goals and helpers, but it's worth noting that he is a plus-player boasting a +2 over those games and on that last place team in 2006-07, Potulny was one of only 5 Flyers with a rating above even (He was +1 and Lasse Kukkonen's +4 was a team high). Why Potulny will make the team: Potulny is coming to camp and knows that the only roster spots that are open are perhaps on the 4th line at best, more likely a pressbox seat. Having spoken with him it's clear to me that not only does he understand that but he accepts that if he makes the team, it will be as an energy player. Unlike Brule who to me seemed much more focused on playing a larger role than he did in Columbus (who were not as deep as Edmonton last year let alone this year), Potulny appears ready to accept a llimited role as a utility player and has the experience in that role already. He's not big but at 6' and 192 lbs, Potulny isn't exactly small either. Of the players I am considering for this series, Potulny is probably the player I see being the least affected by being a healthy scratch for stretches of games. The Grand Forks North Dakota product says that he's played all three forward positions while growing up through the USHL, NCAA and pro so he's definitely got versatility to play on either wing or down the middle. As my friend Allan Mitchell pointed out recently at his blog (Lowetide) Potulny is a shooter. Finally, and I don't think it's something that can just be glossed over, is that Potulny has the waiver scenario on his side. According to new Assistant GM of Legal stuff Rick Olczyk, Potulny would have to clear waivers before he could be sent down to Springfield in the AHL. Schremp and Brule do not. As I've said before, the likelihood of a player passing through waivers safely is generally higher the earlier in the year it is because if plucked from the wire, the new team would have to keep Potulny on the NHL roster. (Again I use the Patrick Thoresen in 2007-08 comparison for Potulny in this regard). I find it hard to imagine that any team would risk losing a player for nothing unless they knew he couldn't really help the team in the long run. Can the Oilers say that about Potulny at this point? Keeping in mind that he was a star in college and is only celebrating his 23rd birthday this September 5th... I think not. Why Potulny will not make the team: As I said with Schremp and Brule, the competition for the spot will be fierce and so if anyone starts out slowly, it could be costly. Potulny will be just getting familiar with his surroundings, new teammates, coaches, facilities and on-ice systems... an adjustment period should almost be expected yet this year it might not be overlooked. Head coach Craig MacTavish could be called a creature of habit in that he normally sticks to what and those he knows (until last year's influx of new faces that is). The head coach's unfamiliarity with Potulny could start him behind in the fight but Patrick Thoresen again provides a recent example of a player who came out of nowhere to make an impression on the coach. If you compared Potulny to the rest of the 'bubble boys' I'm covering in this series, you could make the argument that he is the player who doesn't stand out in any way. He's not the best scorer, not the best playmaker, not the fastest, the toughest, etc. How will he seperate himself from the field? It's tough to try and predict how Potulny fits into the pecking order of the organization. The team's depth chart on their website shows Potulny, Schremp and Brule all as the "5th line". If that can be taken as an honest ranking by the team then it's safe to say Potulny is on even gorund with those two higher profile players. Will Potulny be the surprise of camp or just another also-ran? The Oilers are hoping their Wild Card turns out to be an Ace in the hole. Potential, potential, potential... Gilbert Brule has got so much of it that it makes you want to forget just how much of an underachiever he's been. I could have said 'disappointment' but I honestly don't know yet if that's the right adjective to describe Brule's NHL career. Certainly it's disappointing that he's not done more with the 146 games he's had but without the first-hand knowledge of how he was used, who he played with and his demeanor in Columbus, I'm still reserving final judgement. Edmonton picked 25th overall in 2005 and came away with Andrew Cogliano, a player who looks like he could be a valuable piece of the Oiler puzzle for years to come. The Columbus Blue Jackets grabbed Brule 6th overall the same draft and expected that he was a player who would step right into their line up the following year and contribute at a high level. Dean and I just had Gare Joyce on the show, he wrote a terrific book during 2006-07 called Future Great & Heartbreaks and in it he remarks a few times about how thrilled and excited Columbus was that Brule fell to them in 2005. Clearly the word disappointment is a fitting one if you are looking at Brule from a Columbus perspective. Recently I wrote a feature on Brule (see here) so I'm not going to go into great detail about him again in this series. We had Brule on the show a couple weeks back (see here) and we talked to him about his career thus far and how he feels about the trade to Edmonton. "I took [the trade] as a big positive," he said, "I got the message in the morning and I was ecstatic, I jumped right out of bed because I couldn't believe that I'd been traded. It was good news for me and I was very happy." Sounds to me like a guy who was hoping for a change in scenery (or simply a player saying the right things after a trade). Brule went on to say that he's viewing the deal as an opportunity at a fresh start. "In Edmonton I think they're going to enjoy the way I play hockey," Brule said, "I play a pretty aggressive style, I'm a very fast skater and I think I can fit in alongside a lot of guys there that are the same type of players." You wouldn't want a player with 146 NHL games under his belt to talk about a possible stint on the farm but if there is one thing I'll remember about this interview it's that Brule obviously wants nothing to do with the AHL. "I wasn't playing too much [in Columbus] and things just weren't working out the same as they were the first year and I hope that Edmonton will give me more of an opportunity, that will be good for me I think." "The NHL is the perfect thing for me right now, I need that challenge right now. Obviously the last two years have been a challenge but I'm looking forward to this year because I'm coming to camp in shape and I'm going to be more ready that I ever have." Why Brule will make the team: Gilbert Brule has several things working on his side not the least of which is experience. Of the players he's likely fighting with for a roster spot, his 146 NHL games is more than the rest of them have combined. That is definitely a fact that helps his cause. His speed has 'Oiler' written all over him; it's the one trait that Edmonton has historically valued to a fault. If you're looking to fill out a 13th forward spot then normally NHL teams will look to do so with a player that they can envision playing a 4th line role. Brule can deifnitely do that. With his combination of speed, sandpaper and physical play, he is an ideal energy player but with his still dormant offensive upside, he could be much more. NHL comparisons I've been given range from the over-used Darcy Tucker-Sean Avery to Mike Peca. Yesterday I heard Robin Brownlee throw out a Theo Fleury suggestion which also makes a lot of sense. With Curtis Glencross gone, and the obvious benefit a pest brought to the team when he initially came over, the Oilers would probably like to have that element available to them again. Brule can fill the role Glencross did in pretty much the same fashion. Positionally Brule is a natural center but for the past few years he's played right wing. On the show he admitted that his preferance is in the middle but if he's asked to play on the wing he will. Versatility is a positive. Let's call a spade a spade... players picked 6th overall get the opportunities. Why Brule will not make the team: The prevailing vibe I'm getting from inside and outside the Oilers organization, which has become increasingly tight lipped, is that Columbus rushed Brule. He's struggled under expectations and as a result his confidence is shot. In my opinion it sounds like they feel Brule would benefit from time with the Springfield Falcons. Right now Brule doesn't have to clear waivers to be reassigned but that will change once he's played 12 more games. Therefore, if they're going to send him to the farm it will definitely be sooner as opposed to later. Aaron Portzline of the Columbus Dispatch described Brule as an introvert, shy and a bit of an odd duck. Individuals normally don't thrive in the Oiler system which has long been considered an unusually tight knit group. Brule told us that Ryan O'Marra and Cogliano were the only two Edmonton properties that he has much past experience with. Time on the farm getting to know the rest of the guys might be viewed as a plus. Would he be negatively affected if he's a healthy scratch? I think he would from a mental perspective. I think his development needs him on the ice and I would argue that playing big minutes in Springfield would be better for him than sitting in the pressbox. However, of the guys he's competing with, I'd suggest that with Brule's NHL experience already in hand, he could sit more than some others could without it being as much of an issue. The mental side of not playing for his new team, one he described as a fresh start, that might be tough for him to take. Bottom Line: Brule is definitely in the mix and brings a different bag of tricks with him to the show. Pretty much the only thing he shares with Rob Schremp is the fact that as junors, both were offensive powers. Brule's speed, aggression and personality are a stark contrast to Schremp's and yet both are in solid position to make the club. One final thought - Barring a lights-out performance at camp, I personally believe the Oilers would like to send Brule down. They'd be taking advantage of the small window of opportunity before waivers kick in plus they'd be giving him a major role with the Falcons and a lot of opportunity to succeed in the process thus hopefully getting his offence and his confidence back. BUT... I don't get the impression that Brule would take to that idea very well at all; after nearly 150 games in the NHL to be sent down now? It might be too bitter a pill to swallow. Therefore I wonder if Edmonton keeps him around simply to avoid the possible headache reassinging him could create. Lots to consider. lots to learn and impressions still to be made but that's how I see it right now with The New Guy. I've been covering the Oilers prospects since 2002 and I can say without hesitation that when it comes to young players who can polarize the fanbase there hasn't been anyone like Rob Schremp. He was drafted back in 2004, became a dominant OHL player over the next two seasons, turned pro with a so-so debut but took his game to a new level last year finishing inside the top 10 of AHL scoring. For some that's a career path that indicates a somewhat late bloomer making the adjustment one level at a time. Others see Schremp as a player who will just be another in the long line of junior stars who fail to stick in the NHL (see Peter Sarno and his back-to-back +120 point OHL seasons). Schremp got his OHL start with the Mississauga IceDogs and in his 16-year-old season he finished second in team scoring with 26 goals and 74 points. A 17-year-old Patrick O'Sullivan led the IceDogs that year with 81 points. A dispute between Mississauga's brass and Schremp's agent led to a much publicized trade demand and the beginning of the "bad attitude" labelling that the player is still trying to shrug off. The London Knights gladly took Schremp on and the already talented squad became a powerhouse for the next 3 seasons. The Fulton, NY product was a key player during London's record breaking season in 2004-05 and the Memorial Cup title that year as well. Schremp's six points in the year-end tournament was second only to Corey Perry's seven as the host team downed Sidney Crosby's Rimouski Oceanic in the final. The 2004 Draft pundits were equally split on Schremp's worth. ISS considered him a sure-fire top 5 pick citing him as the 3rd most talented player available behind Alex Ovechkin and Evgeny Malkin. Redline Report wasn't nearly as supportive and were leading the charge when it came to the "Schremp has attitude" critiques. In August of 2004 I conducted a nearly hour-long phone interview with Schremp for a feature I was doing at Hockey's Future. Schremp was training in Chicago with other players who share the same agent, LA Kings forward Dustin Brown being one. The purpose of the interview was simple; find out one way or another exactly what kind of kid this was and put the attitude to the test. Schremp spoke candidly and didn't shy away from direct questions. I'll admit I baited him a few times, (asking him about being benched in the OHL playoffs for example) just to see what reaction I would get. You can read that feature here. I'm a big fan of Stephen King, the author most identified with classic chillers like Carrie and IT while his best work is more often the source material for movies like The Shawshank Redemption, The Green Mile and Stand By Me. I remember reading a review that someone had given to King's The Dark Tower series which was short but memorable: "The world is divided into two groups; those who love The Dark Tower books and those that haven't read them yet." When I hear people say that Rob Schremp has attitude problems I always think about that book review. Those who believe Schremp has an attitude problem haven't taken the time to talk to or get to know the guy. I've talked to coaches, teammates and trainers both past and present and have yet to have a single person describe Schremp to me as a problem. Not one. Period. Now before this turns into a full fledged love in... Schremp is not perfect. But what it didn't show was that the fan had gobbed on Schremp as he was leaving the ice. The end result just gave the critics more fuel to add to their fire. 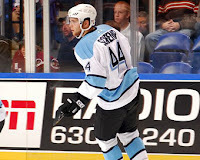 Schremp eventually turned pro and spent 2006-07 with the Wilkes-Barre Scranton Penguins. He had 53 points in 69 games which isn't bad considering he was a healthy scratch upwards of half a dozen times that year. It was a learning year for Schremp who had believed he would stick with the Oilers out of training camp. 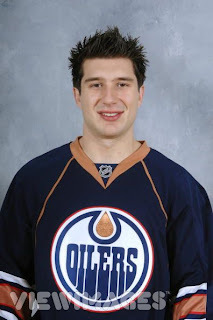 A late season knee injury kept him out of the playoffs and also kept him off the training schedule that he'd need to follow before reporting to Edmonton for a chance of making the team in 2007-08. He was cut again and spent all but 2 games in Springfield with the Falcons where he notched 76 points in 78 games. Rumors of a potential European option surfaced but were quickly shot down by Schremp and agent Scott Norton. Norton's comments seemed to indicate a level of expectation by agent and player alike that Schremp's minor league days are now behind him and with the depth of the Oiler roster in May, the speculation that a trade around the draft became popular discussion. However, Schremp was not dealt and has instead dedicated himself to a rigorous off-season training schedule in advance of this coming September's NHL training camp. The question becomes: Is this the year Rob Schremp makes the Oilers out of camp? Going back to the scenario I outlined here where there are two forward spots available, you have to believe that Schremp's chances are very good. Why Schremp will make the team: After two years in the minors he has adapted his offensive game well enough that he was the go-to guy at the age of 21. He's done everything that's been asked of him at the minor league level including making an adjustment to LW, a position he'd never played before last year. It may have taken him a little longer than Oiler fans had hoped but Schremp has proven that his offensive abilities were not left in London. The knock on Schremp the hockey player has always been two-fold; 'not fast enough' and 'doesn't compete hard enough'. If after this full summer of dedicated workouts under the care of the team's fitness coach and several Oiler veterans Schremp isn't in the best shape of his life then something is wrong. Captain Ethan Moreau recently told listeners to Bob Stauffer's Total Sports that he was impressed with the effort Schremp was putting into getting ready for the year. Coach Craig MacTavish also said he'd heard good things about the player's progress. In conversations I've had with Schremp he's indicated his belief that the strength and conditioning work he's done in California will address his speed. 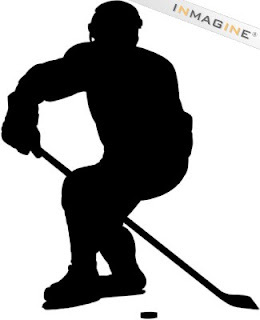 During his July 8th appearance on The Pipeline Show Schremp made his ambitions for the season crystal clear when he said "Enough screwing around, I want to play in the NHL... I don't want to be a minor league player anymore." If he can show that same desire and drive on the ice then he'll be one step closer. Why Schremp will not make the team: Three things stand in the way of Schremp and the NHL; Politics, competition and himself. He can only control the latter and as previously described, he seems to be doing his best to prepare this summer. The competition will definitely be fierce hence the reason I'm doing this little series. As I outlined in the prologue, I see it as a 5-man race for 2 spots so Schremp cannot afford to slack off during practices and will have to contribute in the exhibition schedule not matter who is on his line. Andrew Cogliano, Sam Gagner and Kyle Brodziak all made the team out of camp last year and all, at some point, played alongside non-scorers and still found a way to impress. By politics I mean contract status. Schremp is entering the final year of his entry-level deal and is still waiver-exempt... which weighs the scale against him. If the battle is tight, if Schremp hasn't clearly distanced himself from the others vying for the job, the team can send him down without risk and historically that's what they've done. Finally, the last hurdle in Schremp's way is simply convincing the organization that making the team as the 13th forward, not playing every night but practiving every day in a NHL environment with NHL players is better than playing a ton in the AHL. It's a tough sell because most NHL execs I've talked to feel playing is better than watching. It could be a case where Schremp is sent down to the Falcons where they know he'll be the top dog, play 1st power play and bide his time waiting for a hole with the Oilers to open that gets him a recall. 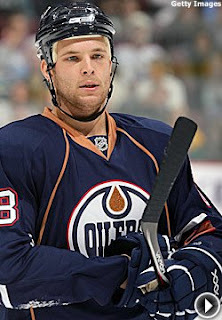 There is no question that Oiler fans want to see Schremp on the team sooner rather than later. In a recent poll on our show's website Schremp was the runaway pick by fans when asked to name their 13th forward. No surprise really, he's always been The Fan Favourite. The goalie in the picture is Jeff Drouin-Deslauriers, or I should say it was. These days he's just Jeff Deslauriers and he's not sporting the Edmonton Road Runners gear anymore either. I actually still like those sweaters though... not the logo but the colour scheme worked for me. Anyway, the reason I slapped ol'JDD up here is because he's one of the guys who could very well have an impact on which forwards make the Oilers out of camp. Or maybe more accurately, how many forwards make it. Let me explain. Over the next few weeks I'm going to talk about the battle over the last couple roster spots as training camp is now about 45 days away. First I want to remind you that of the 23-man roster there is the very real possibility that the Oilers could have 3 goalies and 8 blueliners, although in that case they'd likely consider Jason Strudwick the 13th forward. Casual fans might forget that Jeff Deslauriers and Mathieu Roy are both in the situation where they would need to clear waivers to get to Springfield in the AHL. Both might pass through unclaimed... but it's a risk and no team wants to just give away assets. It's easier to sneak someone through waivers early in the season - see Patrick Thoresen last year who made it through before Christmas but was scooped up by Philly in the second half. Unless the Oilers (1) find a taker for Dwayne Roloson's contract either through trade or waivers or (2) try and push JDD back through waivers to the farm... Edmonton will have 3 goalies. For the sake of argument, let's say they do manage one of the above and also find a way to only carry 7 defenders leaving room for 4 full sets of forwards and the normal 13th and 14th pressbox spots up front. I am going to go out on a limb (note the sarcasm) and declare 11 of the forward spots already clearly taken. Yeah I know, really a tough job there. Cole, Horcoff, Hemsky, Penner, Gagner, Nilsson, Cogliano, Moreau, Pisani, Brodziak and Stortini are givens. In my opinion, so is Marc Pouliot and his nice new, bargain basement contract. He'd need to clear waivers to go down (and he wouldn't make it through anymore) and really, you need cheap forwards to round out your bottom 6 so Pouliot... at the very least has a spot waiting for him to claim outright in camp - not the first time he's had that and failed but this year waivers are on his side. The last 2 spots (if they aren't claimed by the 8th D-man and 3rd goalie) are up for grabs and in my mind it's a 5-man battle. 5 different players; different ages, different talents, strengths and weaknesses, different contract situations and different expectations. The Fan Favorite, The New Guy, The Wild Card, The Forgotten One and the Underdog. I'll break them down over the next little bit.